» Lou Reed — It has been said that the Velvet Underground sold only a few thousand copies of their first album, but everyone who bought one started a band. Indeed, their influence has been immense, and over the span of the four studio albums for which Reed was the principal songwriter, lyricist and singer, they laid the foundation for much of rock music that lies outside of the mainstream. Reed also had a notable solo career, with music ranging from glam rock (the Transformer album with the hit “Walk on the Wild Side”), dark drama (the album Berlin), avant noise (Metal Machine Music) and much more. Reed performed at Campbell Hall in 2006. 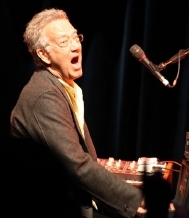 » Ray Manzarek — He is best known for being the co-founder and keyboard player for The Doors. Since The Doors didn't have a bassist, he also usually covered the bass parts on the keyboard as well. The Doors recorded six acclaimed studio albums before singer Jim Morrison died. Manzarek has also recorded several solo albums, including The Golden Scarab and The Whole Thing Started with Rock & Roll Now It's Out of Control, both from 1974. His production credits include the debut album by Los Angeles punk band X. Click here for a review of Manzarek's concert at the SOhO Restaurant & Music Club in March 2010, and here for his advice to aspiring musicians. » George Jones — He is regarded by many as the greatest vocalist in the history of country music. He had No. 1 hits in the 1950s, 1960s, 1970s and 1980s, including “White Lightning,” “She Thinks I Still Care,” “The Grand Tour” and “He Stopped Loving Her Today.” Despite his hard-living lifestyle, Jones made it to the ripe old age of 81, with his final concert just a few weeks before he died. » Van Cliburn — He won the International Tchaikovsky Piano Competition in Moscow in 1958 at age 23 with the blessing of Premier Nikita Krushchev, a significant event during the height of the Cold War. He played for every U.S. president from Harry Truman onward. » Jim Hall — An influential jazz guitarist who began recording in the 1950s, he collaborated with Sonny Rollins, Bill Evans, Pat Metheny and many others. He received a Jazz Masters award from the National Endowment for the Arts in 2004. » Hugh McCracken — One of the greatest session guitarists ever, he played on recordings by Van Morrison (you can hear him on “Brown Eyed Girl”), John Lennon, Paul McCartney, Paul Simon, Bob Dylan, Steely Dan and many more. » Richie Havens — He was a folk singer/guitarist who opened the Woodstock concert in 1969, playing for three hours because other acts were delayed in traffic. He released more than 20 albums during his career. » Bobby “Blue” Bland — He brought influences from blues, jazz, pop and more to his vocals, on display in hits including “Little Boy Blue,” “I Pity the Fool” and “That's the Way Love Is.” “Turn On Your Love Light,” a song first recorded by Bland, was often covered in concert by The Grateful Dead. Bland was elected to the Rock and Roll Hall of Fame in 1992. » JJ Cale — Best known through cover versions of his songs “After Midnight” and “Cocaine” by Eric Clapton, he was a hugely respected singer/guitarist/songwriter who helped originate the Tulsa Sound. » Slim Whitman — One of history's most famous yodellers, he sold millions of records, many through seemingly ubiquitous TV commercials in the 1970s. He showed his sense of humor by allowing his music to be used for killing the aliens in the movie Mars Attacks! » Kevin Ayers — A co-founder of the pioneering prog rock band Soft Machine, he left after the band's first album for a solo career that included 1969's Joy of a Toy, 1971's Whatevershebringswesing and 1973's Bananamour. » Jeff Hanneman — He co-founded and played guitar for thrash metal pioneers Slayer, whose 1986 album Reign in Blood is often hailed as one of the most important and influential heavy metal albums ever produced. Click here for his advice to aspiring musicians. » Patti Page — She was the best-selling female artist in the 1950s, with hits including “Tennessee Waltz” and “(How Much Is That) Doggie in the Window.” She continued to have hit songs into the 1960s. » “Shadow” Morton — He is best known for his songwriting and production for the girl group The Shangri-Las, including co-writing the song “Leader of the Pack.” He also produced recordings by Janis Ian, Vanilla Fudge, Iron Butterfly (“In-A-Gadda-Da-Vida”) and The New York Dolls. » Phil Ramone — He produced recordings by notable artists including Paul Simon, Billy Joel, Ray Charles, Bob Dylan, Aretha Franklin and many more. » Andy Johns — He engineered classic albums by Led Zeppelin, Jethro Tull, The Rolling Stones, Blind Faith and more, and produced recordings including television's Marquee Moon. » Jimmy O'Neill — host of Shindig! » Amar Bose — audio engineer and founder of Bose Corp.